Don't look now, but everyone's favorite bad boy has notched a spot in the Penguins lineup, even if it is temporary. I speak of none other than Tom Sestito. As shocking as it may be to some, Sestito has made a significant change in his play and his on-ice approach. He has even been working on aspects of his game, like puck protection, with coaches Rick Tocchet and Sergei Gonchar. Aside from his dance with Chicago's Jordin Tootoo, his preseason play raised eyebrows (in a good way). He was more aggressive with the puck instead of with opponents. He was battling along the boards. He was engaged in the play instead of being in someone's face. And though it may just be for insurance purposes, the Pens coaching staff took notice. They sent younger, admittedly, more talented players back down to Wilkes-Barre and kept Sestito in Pittsburgh. Sestito, a rare enforcer on a hockey team built on speed and skill, signed with the Penguins in 2016. Since 2007-2008, he has 42 fighting majors in 141 games played in the NHL. Add that to the 67 he has racked up in the AHL. His calling card looks more like a FBI rap sheet. Sestito had only 14 points (five goals, nine assists) in 41 games with the Baby Pens last season. In his four games with Pittsburgh, he claimed 13 hits, only one assist, and tallied nineteen minutes of penalties including a fighting major. Though rough around the edges with a mouth full of sass, his play during the last season shows snaps of true competitive ability. His best game with the Penguins came April 7th when he got that nifty assist against none other than Thursday's opponent, the Washington Capitals. Up against younger talent, Sestito rose to the challenge before him. Coaches wanted him to be more effective on the forecheck. His improvement during the preseason was enough to put his name into contention for a spot in the lineup that was left vacant due to prolonged recovery time needed for forwards Bryan Rust, and now, Sidney Crosby. The 6-foot-4-inch beast on skates (when he hits you, you know it) displayed enough foot speed to be competitive. A lot of hockey experts, analysts, and fans don't like him. I am a little old-fashioned and I have no problem having a big body with a "take no crap" attitude on the ice once in a while to prove a point. Sestito has a few allies in the locker room as well. Head Coach Mike Sullivan seems to like him and players, such as Sidney Crosby, have shown their support for the big man. Crosby signed a stick for Sestito's new baby (named Killian...no surprise there), writing that he felt "a foot taller with his dad on the ice." There was no better time to have the big man in the lineup than opening night. 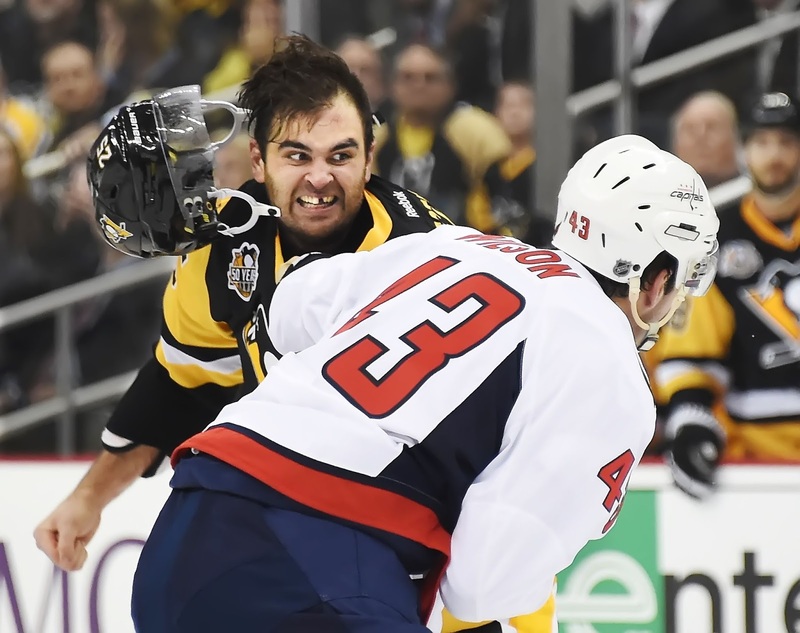 The Capitals are a team known for trying to use brute force to overtake and wear down their opponents. However, Sestito was having none of their shenanigans. After hearing that Capitals winger, Tom Wilson, planned to fight the Penguins Tom Kuhnhackl after an inadvertent strike to the Caps goalie, Sestito took matters into his own hands to defend the young winger At 8:54 of the first period, Sestito let Wilson have all he could throw at him. Sestito would only play 3:52 in the entire game Thursday night. He even had a prime scoring opportunity, but lack of confidence in his shot caused him to hold the puck too long and then force a pass to an open man behind the net. His efforts, small as they may be, did not go unnoticed by coaches or his teammates. We should play physical," Evgeni Malkin said. "We have tough forwards like Tommy Sestito, good defensemen like [Kris] Letang. We know how we play against Washington, it's a heavy team." True as that may be, the Penguins are not, and will not, become that type of team. It's not their style. They beat the Capitals in the playoffs with skill and speed. After all, you can't defend, or hit, what you can't catch. But having a bodyguard like Sestito around definitely helps some players breathe a little easier knowing he has their backs. Bryan Rust, who practiced with the team Wednesday, will be back to action within the next few weeks, if not sooner. It is unlikely that the team will keep 14 forwards, which means Sestito would be sent back down to Wilkes-Barre due to limited cap space. The days of "putting the foil on" goon-style hockey have been long gone. Players around the league are changing their game in order to stay in contention with the new crop of youngsters eager to make names for themselves. In one of my first columns, I noted that players like Sestito would have to change if they wanted to stay in this league and actually matter. It seems, at least in this case, that change has begun and we can only hope that it lasts.